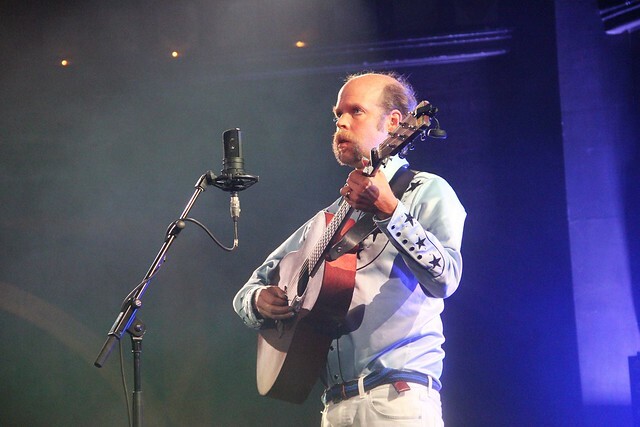 Posted on 10/10/2018 by Mark Engleson	in Live Review and tagged alt-country, Bonnie Prince Billy, country, folk, Kentucky, The Birchmere, Will Oldham. I wasn’t sure what to expect from Bonnie “Prince” Billy. Will Oldham, who has also released music under the Palace moniker (Palace Brothers, Palace Music, and Palace Songs), is something of a cult figure. He also has a varied acting career, with appearances in films ranging from Jackass 3D to 2006’s Junebug to last year’s A Ghost Story. On Tuesday, he made an appearance at The Birchmere, and I was there to figure him out. Confounding expectations, Will brought a jazz band with him to The Birchmere, complete with drums, a horn section, and a string section. One of the horn players alternated amongst the clarinet, saxophone, and xylophone. Another alternated between the French horn and the tuba, while a third played the trombone. The string section consisted of the bass, cello, and violin. Will himself played a very little electric guitar but mostly just sang. Most of the songs were played without any guitar part at all, which made for an interesting contrast with most popular music. In addition to the instrumentation and Will’s lead vocals, one of the ladies from the opening duo The Other Years provided backup vocals. Will drew on his dramatic background in his stage presentation. He incorporated expansive gestures and motions into his singing. With the jazz band backing him, Will’s presentation almost took on the character of beatnik performance art, just with singing instead of poetry. I commented to a friend that Will’s show could have just as easily taken place at any point in the last 60 years. We could have been in the Gaslight Cafe in Greenwich Village in 1958, as we were at The Birchmere in 2018. “Ohio River Boat Song,” from Will’s Palace Music Days, was a tale of love and heartbreak, and again it could have happened today, or 50, or 100 years ago. Why the Ohio River? Because Will is from Louisville, Kentucky. Will’s song “Cows” was his rare song tied to a place and time, written in reaction to visiting a friend in Burundi. Will explained this after playing the song, along with the excuse that he is distracted by the lurking menace of our president. Will also included two covers in the program: the Everly Brothers’ “Omaha” and “People Living,” a cover of Norwegian artist Susanna Wallumrød. This year, Will released Wolf of the Cosmos, a track-for-track interpretation of Susanna’s 2007 album Sonata Mix Dwarf Cosmos. Will doesn’t tour overly often, so getting to see him was an event. A fellow concertgoer told me that every time Will tours, he remakes his arrangements, so the presentation is new and fresh. If that’s the case, I can’t wait to see what Will has in store for us next time he comes around. This concert was simply fantastic, and I have every reason to believe that, whatever he decides to do next time, that will be, too!